The hospitality industry is one of the more obvious touch screen markets. When the end goal is the comfort and ease of guests and visitors, touch-integrated monitors and displays are the perfection solution. They both impress and add value to the customer’s experience. A touch monitor could allow guests to check in or out of the hotel, to reserve a future stay, or to print boarding passes. A monitor or display might feature flight information, possibly information specific to the person using the device. 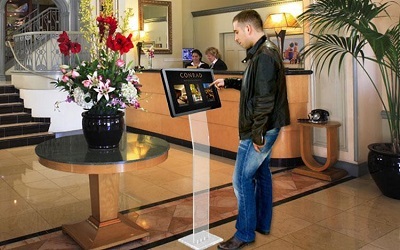 The hotel might employ a touch-integrated kiosk so that guests can find their way around the hotel or neighboring area. An interactive digital display could allow guests to preview upcoming hotel specials or to search for nearby restaurants or entertainment venues. Employees can use the touch monitors and displays to engage with customers. Incorporating a touch-integrated solution into the employees’ workflow has another value add; a streamlined work process frees employees to focus on their real work, which is ensuring the happiness of guests and customers. Such focus is essential in the hospitality environment; customer service makes or breaks it. A smoother work process also tends to create a much more productive and contented workplace.